An impressive wireless and tonal performance makes this a compelling, if pricey, desktop proposition. The wireless concept really does work! At this price, it may be worth forking out for a giggable Katana. One person’s innovation can be another’s solution to a problem that doesn’t exist, but we should always be looking for new ways to make access to guitar playing easier for us, especially in our homes. Boss has an advantage here, the Katana-Air is an extension of an already impressive range of modelling amps. Now it’s gone wireless with this new 30-watt head - offering us the chance to finally leave the old cable far behind. In fact, it’s being touted as the world’s first full wireless amp because there’s the option for the amp itself to go battery powered too. So just how useful and effective is this package from Boss? The innovation here would mean little if it was attached to an average product. Similar to Line 6’s AMPLIFi 30, the Katana-Air balances traditional tactile controls on the amp with app functionality for dialling in effects models - over 50 here via the Tone Studio app. We like the simplicity of the five-channel selection from acoustic preamp to the hugely satisfying Brown sound. 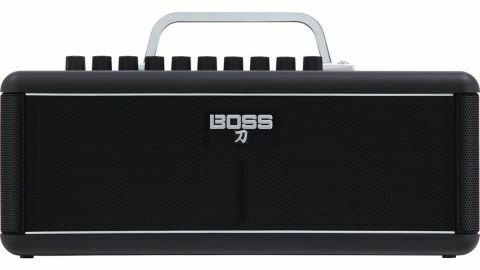 The latter is Boss’s high-gain custom channel that first appeared on its high-end Waza Craft head and is a superb showcase of the valve-like character and dynamic Boss has managed to capture here with its COSM technology. Elsewhere, there’s clean to crunch and even a mode for your electro acoustics. It’s some of the very best amp modelling we’ve heard from a relatively affordable amp. Connectivity with the wealth of modelled Boss effects is a major plus point, too - the company has built a reputation on its stompboxes with many, like the Blues Driver, becoming industry standards. It’s also good to see obscure, long-discontinued fare like the Slow Gear here alongside models of non-Boss icons like the Rat and Phase 90. The Bluetooth connectivity with our guitar is seamless; plug the included transmitter into your guitar and turn the amp on. It’s that simple and it works with ultra low latency as promised. We wanted to test how far away we could be and still use it; and got to nearly 20 metres with a wall between before we ran out of space to go indoors. We also had it working fine between floors... if you need that! The size (think small toolbox rather than lunchbox) could certainly work well on a desk at home for lower volumes. But are cables themselves really a problem for most of us? We’re not convinced the connectivity and the smaller ‘lifestyle’ dimensions are quite worth the extra money over the bigger giggable Katanas, but in terms of what it sets out to do, there’s no doubt this does it particularly well.